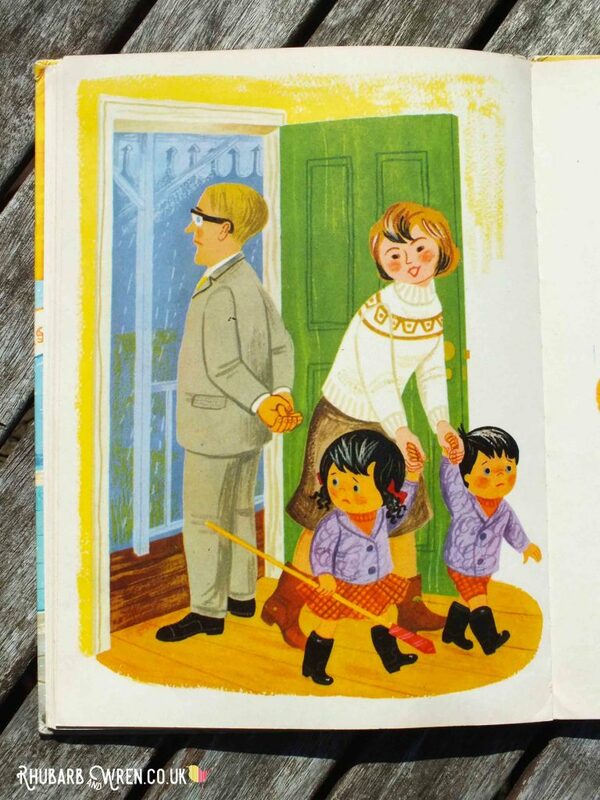 Like many other kids of the 70s and 80s, I grew up reading the original Topsy and Tim books in all their brightly-coloured and fantastically illustrated splendour. 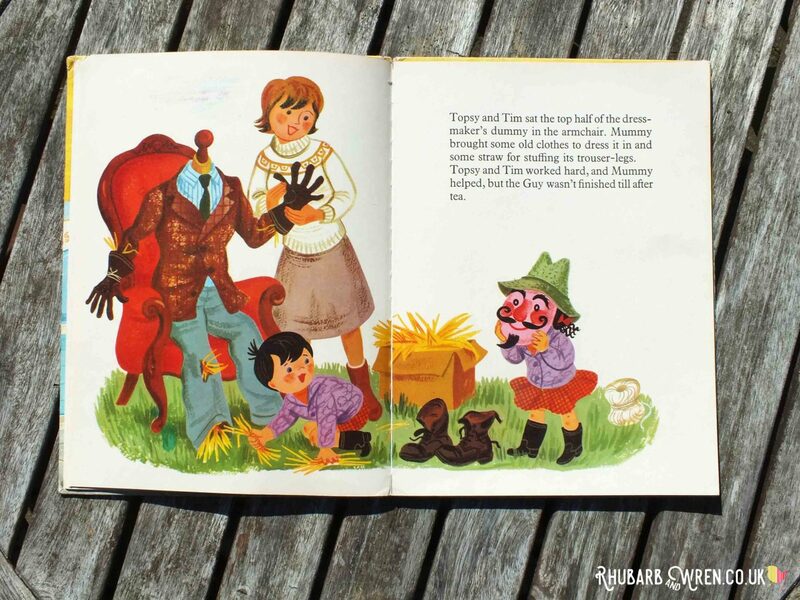 Nowadays, I love sharing my little collection of vintage editions with my children – they’re just as captivated as I was by the charm and wit of these original versions. Personally, I much prefer the gorgeous original artwork of these over the rather bland re-drawings done for the newer Penguin editions, and my kids enjoy how much more mischievous the twins of old were compared to these (let alone the TV twins). For a modern parent, the opening title page of this vintage Topsy and Tim adventure sends shudders down the spine. How could this possibly end well? Thank goodness for that! 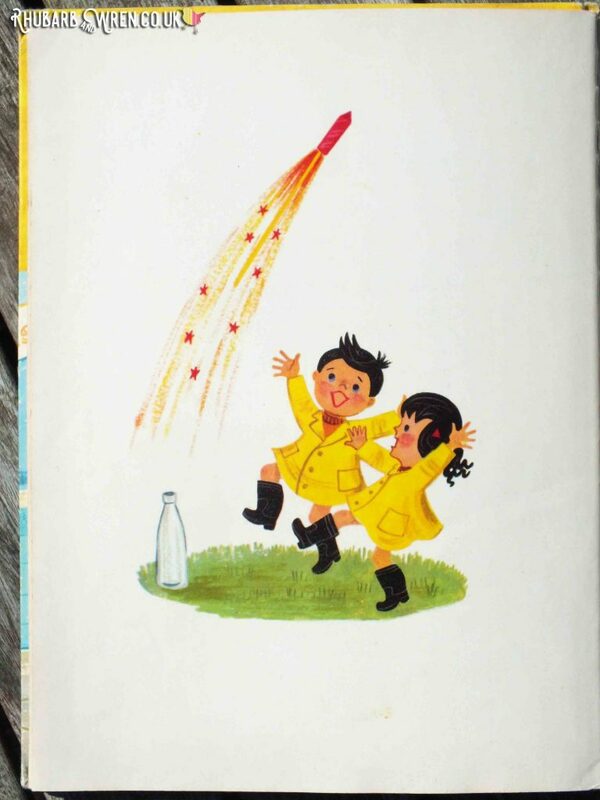 All ends happily for Topsy and Tim with a successful firework launch from a milk-bottle. 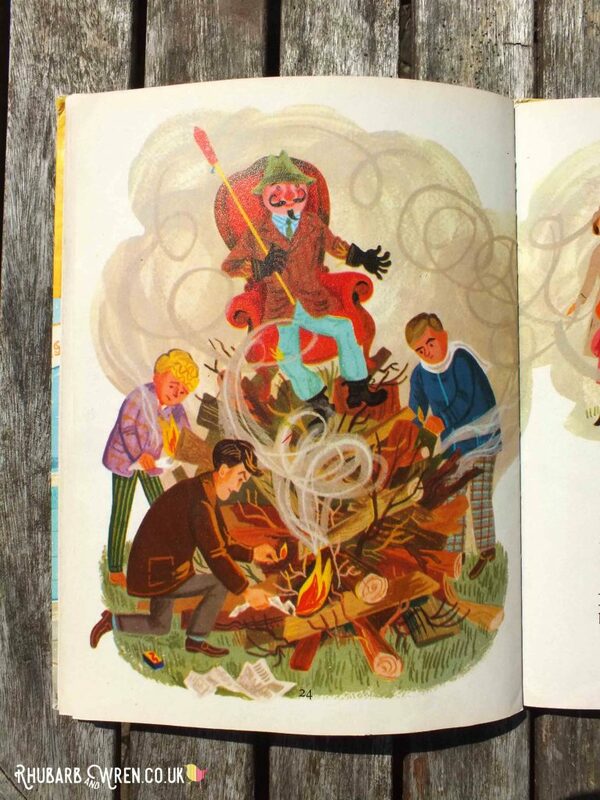 ‘Topsy and Tim’s Bonfire Night’ illustrates this perfectly. The cover shows Topsy and Tim running gleefully out of a shop clutching a Guy Fawkes mask and a couple of fireworks – not an activity you’d associate with today’s preschoolers. Let’s just hope that they’d paid for them… not a given with those two! And then there are the opening and closing illustrations that bookend the story. 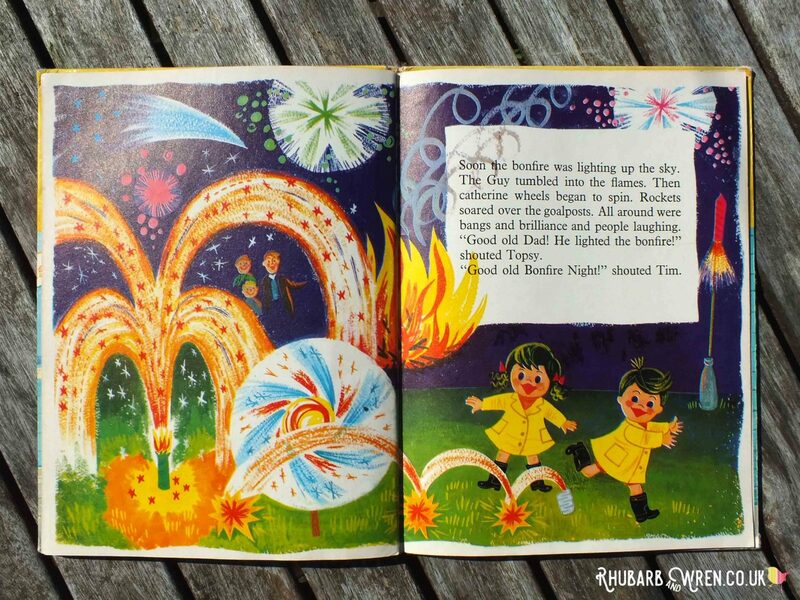 In the first, Topsy and Tim have found a milk-bottle to use for launching their firework, which sets up the end page payoff showing a rocket shooting up in a shower of sparks, while the twins dance around in excitement. I don’t think there’s much doubt about who lit that fuse! Topsy and Tim take equal roles in destroying this perfectly good dressmaker’s dummy, with dad so gleeful, it makes you wonder what horrors were created on it. Jean Adamson has said in interviews that she and her late husband, Gareth Adamson, devised the Topsy and Tim series after visiting a bookshop in Northumberland in the late 50s, and finding children’s books that were full of dragons and fairies and witches, but none that reflected modern real life experiences for the average 50s child. Both Jean and Gareth were trained illustrators and were inspired by this experience to create Topsy and Tim, forming an author-illustrator team with Gareth doing the writing and Jean the illustrations. Was this suit created on that dressmaker’s dummy? 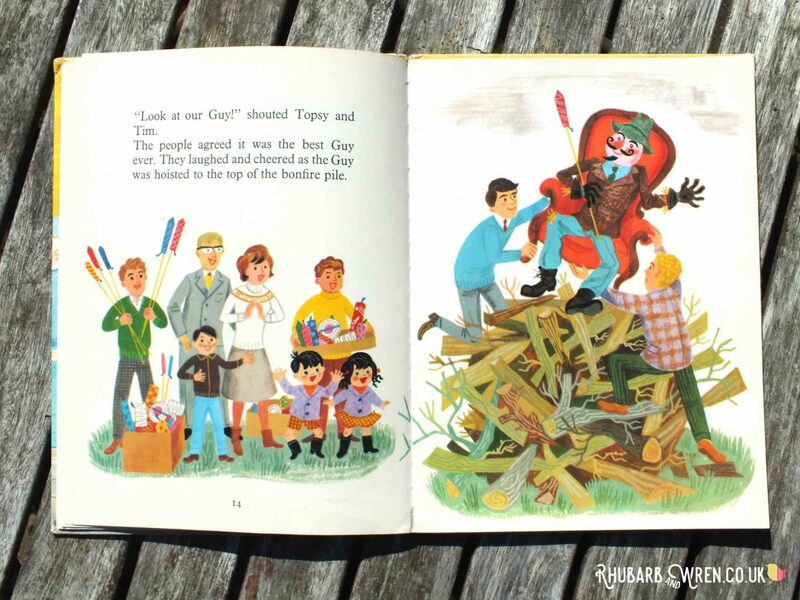 Topsy and Tim help mum make a guy for the Bonfire. The style of those beautiful illustrations was developed very deliberately, with Jean using all the skill and sophisticated techniques she had gained studying and teaching design at Goldsmiths. 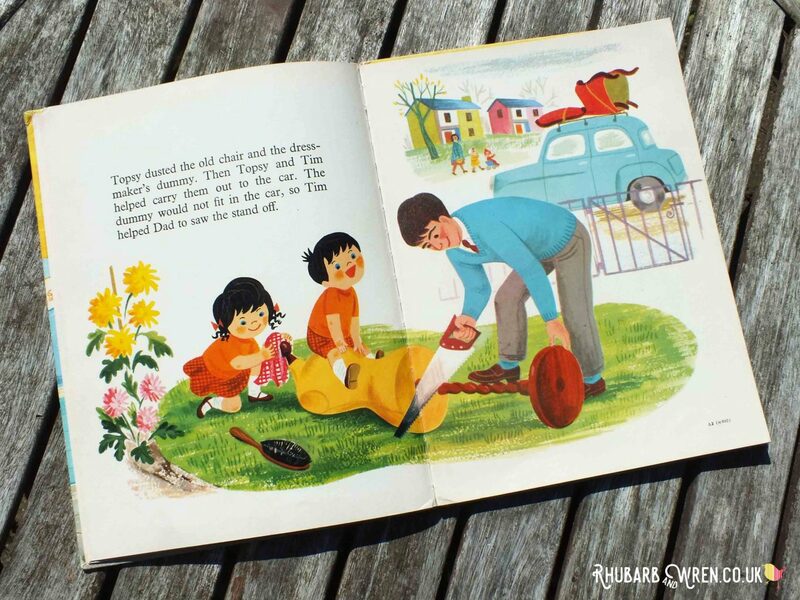 According to Jean, the characters of Topsy and Tim were ‘carefully constructed to be instantly recognisable little icons and the illustrations had a bright, uncluttered look, but plenty of texture’. They were groundbreaking for children’s books at the time in being full colour throughout, and they were a hit right from the start. 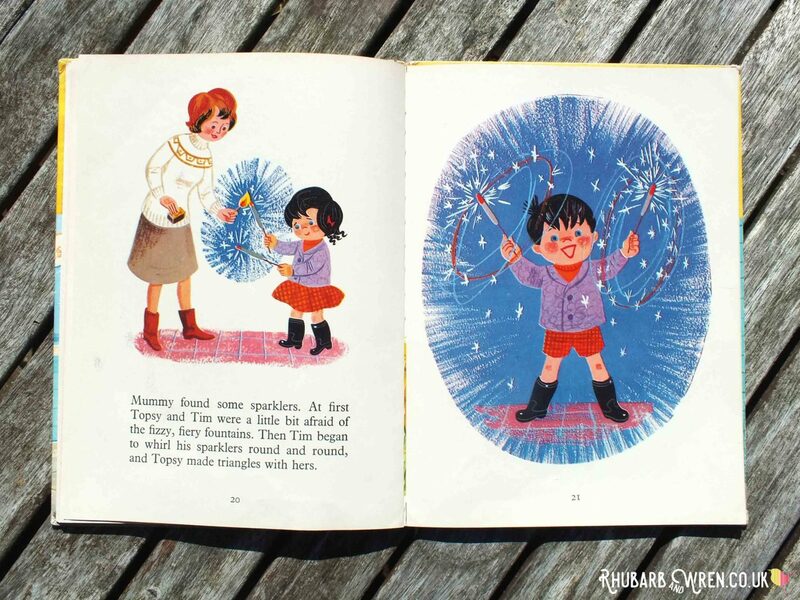 It’s easy to underestimate the artistry going into these illustrations in ‘Topsy and Tim’s Bonfire Night’ because they are so effortlessly bright and cheerful, but look closer and you see how effectively these simple forms capture the emotions and actions of the characters. Look at the stretch in the legs of the man in green trousers, above, for example, as he helps place the guy on top of the tottering pile of sticks. You can really feel how precarious it all is just through the arch of his foot and that over-extended leg. I love little details like Topsy and Tim’s chubby, scabby, knees; the curve of their mother’s back as she stoops to hold their hands; or Topsy tugging on her mother’s skirt in a way that every parent in any era will have experienced at sometime. Despite the deceptive simplicity of the images, they perfectly capture those childhood moments that are just as true today as when the books were first published. 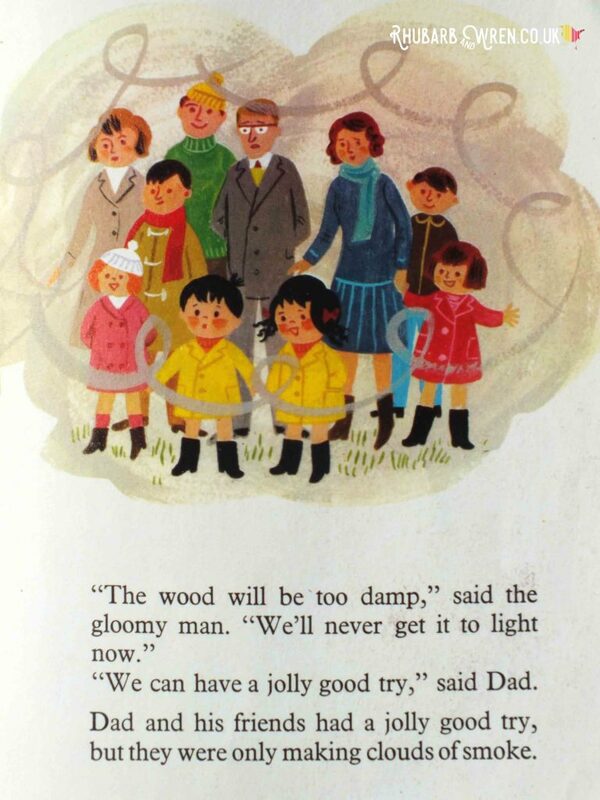 A moment of mild peril, when rain threatens to dampen Topsy and Tim’s pyrotechnic ambitions. I was intrigued to learn that it was also a very deliberate – and very modern – decision to make Topsy and Tim girl-and-boy twins with equal status in the stories, in order to give the girl character the same opportunities for getting dirty and being naughty as her brother. Gender stereotypes were almost universally unchallenged back in the 50s and Jean recounts in several interviews how annoying she found the lack of parity between boys and girls as a child. Rain stopping you from lighting the explosives-filed bonfire? Let the children play indoors with sparklers instead! This no doubt fuelled her determination to make things more equal in her and Gareth’s creative endeavour. Topsy and Tim share their adventures pretty equally – especially considering when they were written – and indeed Jean has said that when Gareth gave her the text to illustrate, she would occasionally change the names around ‘if I thought he’d given Tim all the best bits’. 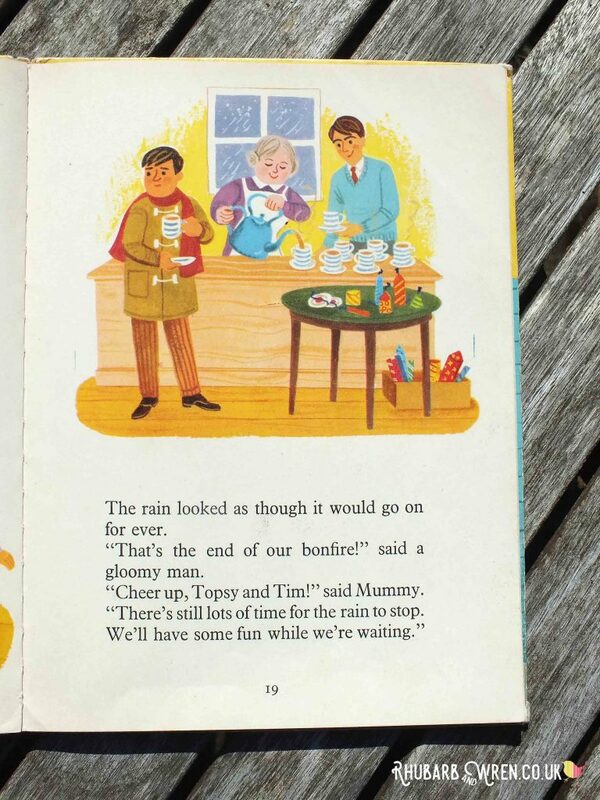 The text in these vintage Topsy and Tim books is often as dryly witty as the illustratons. Topsy and Tim themselves were were not based on real people but their adventures were at first inspired by the real-life antics of the couple’s own friends, family, and then on their own family life once they had children themselves. Other characters in the books were based on actual people they knew, so even the most incidental of characters feels like an individual. This is undoubtably part of the enduring appeal of the books – so much is recognisable and relatable in the world the twins inhabit because their adventures and the people they meet are all from the everyday, ‘real world’. Jean Adamson has said how, for her, the books are full of memories, with scenarios based on her memories of childhood adventures with her brother, Derrick, and then later on detailing the minutia of her and Gareth’s family life – for example, how her children chose and looked after a new pet or events such as a tiger licking the car window on a family outing to the safari park, all inspiring similar stories in the ‘Topsy and Tim’ series, just like ‘Topsy and Tim’s Bonfire Night’. 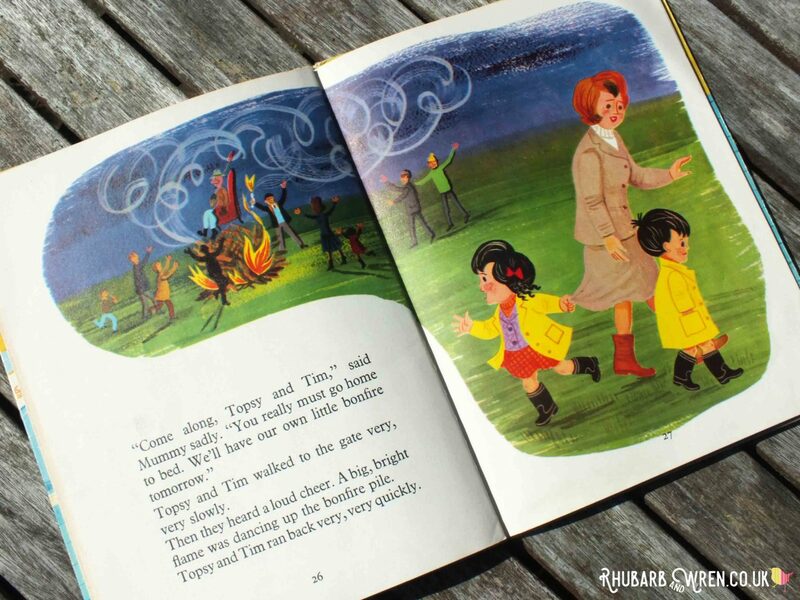 But while the stories may be real, the super-saturated bright colours and simple yet beautiful artwork, as seen in ‘Topsy and Tim’s Bonfire Night’, elevates the books into more than just the everyday, making these everyday little stories truly magical – without a dragon or fairy in sight. I can still remember how passionately I wanted my mum to make me a gypsy costume using curtain rings and scarfs (as in The Friday Book) and how excited my sister and I were whenever we went to see the dinosaurs in Crystal Palace Park (as featured in Topsy and Tim Meet the Monsters). It wasn’t ‘ordinary’ stuff to us back then, and my kids are just as transfixed by Topsy and Tim’s adventures today. Jean herself said that ‘the stories are aimed directly at children, not parents or guardians.’ saying ‘adults sometimes forget that experiences that seem commonplace to them are wonderful, first time adventures to young children.’ This is where these vintage editions win out for me over the more resolutely everyday modern versions every time, and why my kids and I will carry on collecting and sharing them every chance we get. 2013 article from the Independent on the launch of the Cbeebies TV series. Daily Express interview with Jean Adamson on the inspiration for and creation of the books. 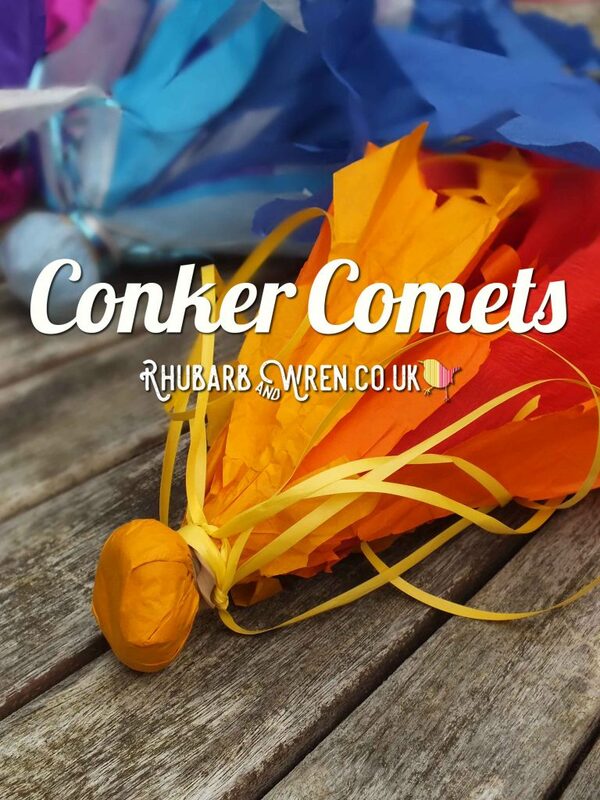 If reading about ‘Topsy and Tim’s Bonfire Night’ has got you in the Guy Fawkes mood, try our bonfire night craft and make some ‘conker comets’ – easy and so much fun for all ages. Or for more on children’s books, take a look at our review of one of our favourite modern children’s classics – ‘The Bog Baby’ by Jeanne Willis and Gwen Millward. 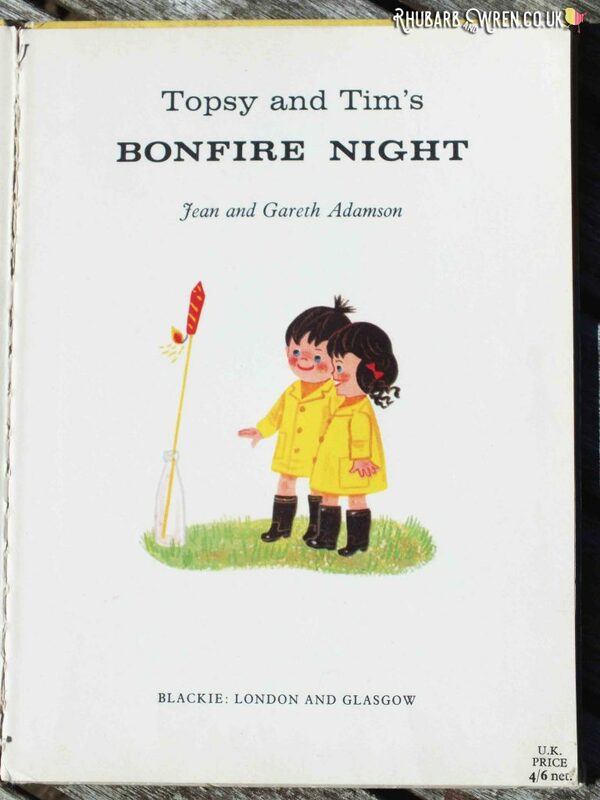 Bonfire Night, Books, Topsy and Tim, Vintage. Bookmark. Aw, thank you! Glad I could introduce you to the ‘real’ Topsy and Tim! I’m not sure I “did” Topsy & Tim when I was small. I find the TV incarnation quite irritating. This little gem is lovely, though! What a great find! Fabulous, isn’t it! Much less po-faced than the modern version, and so beautifully illustrated.